Cast: Michael Caine (Harry Anders), Sean Young (Stacy Mansdorf), Ian Holm (Sir Hector), Bobby Short (Buddy), Alun Armstrong (Osgood), Sam Kelly (George), Jack Shepherd (Stevens), Philip Davis (Westy), Bob Hoskins (Sam Garcia). Crew: Russell Mulcahy (director), Martin Bregman and Michael Caine (producers), Ron Hutchinson (writer), Michael Kamen (music), Denis Crossan (cinematography), Seth Flaum (editor), Grant Hicks (production designer). The character of Harry Anders had been created by a former British spy, Ted Allbeury. In 1992 Bregman told Time Out he hoped to make a series of Harry Anders movies. ‘I wanted to develop something where I could use Michael’s abilities. He’s a touch weathered, which most women find extremely attractive. You never see a romantic man on screen who’s over 40.’ Bregman had strong credentials as a producer, including several of Al Pacino’s best films – Dog Day Afternoon (1975), Scarface (1983) and Sea of Love (1989). He also produced Sweet Liberty (1986), starring Caine and Bob Hoskins. The $7 million film was shot on location around London and at Ealing Studios. Joining the cast for a cameo was Bob Hoskins, returning the favour Caine did for Mona Lisa (1986). Other familiar faces included Alun Armstrong, who made his film debut with Caine in Get Carter (1971), and US jazz pianist Bobby Short, who had a cameo in Woody Allen’s Hannah and Her Sisters (1986). 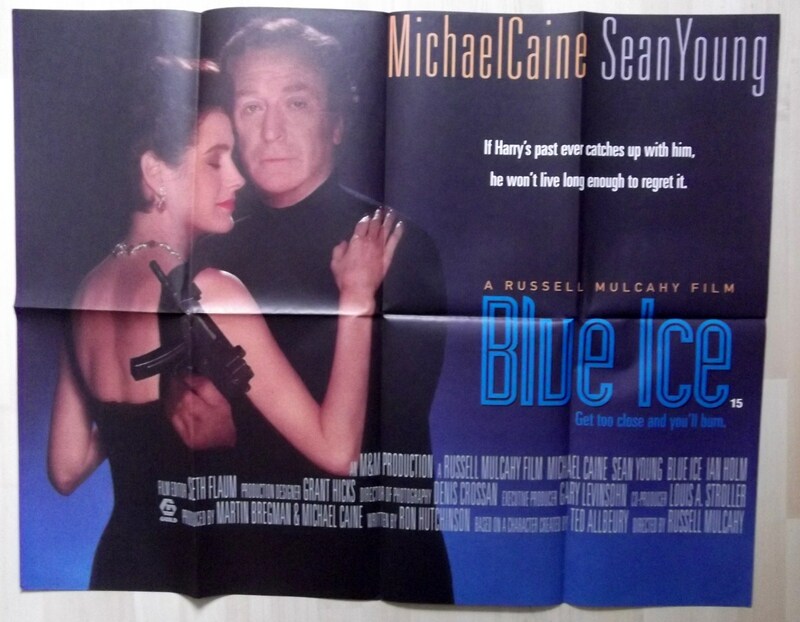 Blue Ice was released in the UK during October 1992 with a 15 rating. The picture grossed just over $350,000 and received mediocre reviews. HBO decided against a cinema release in the US, premiering the movie on cable instead. The film was released on video in both territories during 1993, receiving an R rating in America. The US tape is still available but has been deleted in Britain. A Region 1 DVD version was issued in 2005, but the film remains unavailable in Region 2 format. Verdict: Casting Caine as a retired British spy was always going to invite comparison with The Ipcress File – a comparison Blue Ice will never win. Aside from a hallucination sequence in the middle of the movie, Mulcahy abandons his usual flashy directing for something duller and drearier. It’s a bad sign when a British movie shows Londoners explaining Cockney rhyming slang - to each other. Caine tries his best, but the dialogue lurches from cliché to cringe-inducing. Put simply, Blue Ice is a poor film with few distinguishing features.